NEW YORK, Apr 16 2019 – After a seven-year standoff at the Ecuadorean embassy in London, British police last week arrested WikiLeaks founder Julian Assange–a development press freedom advocates had long feared. Trump has shown little concern for freedom of the press, once allegedly urging then-FBI Director James Comey to jail journalists. (In response to news of Assange’s arrest, Trump said he would leave it to the Justice Department). In this context, the charge on which Assange was arrested seemed modest: A single count of conspiracy (with former Army Pfc. Chelsea Manning) to “commit computer intrusion” under the U.S. Computer Fraud and Abuse Act, with a maximum penalty of five years. “[The] charge here is attempting to help crack a password to steal classified material. Didn’t work but would news orgs do that? (Not in my experience. ),” said Greg Miller, a national security reporter at The Washington Post, said on Twitter. Even if his attempts were successful, they would have helped Manning cover her tracks, but not let her break into a system to which she didn’t already have access. Prosecutors have wide range of latitude; it’s worth remembering that the Obama administration likely had all the same information, but declined to pursue an indictment. So, is it just a pretext on the part of the U.S. government to punish Assange for the publication of classified information — a practice that should be constitutionally protected? The issue comes in a time of heightened concern for investigative journalists and national security reporters. “Given the nature of the charge — a discussion 9 years ago about an unsuccessful attempt to figure out a password — I think it’s fair to debate whether this is a fig leaf for the government punishing someone for publishing stuff it doesn’t want published,” tweeted Scott Shane, a national security reporter for The New York Times. Another reason why the charge may seem so modest: It could be the first of several. Last week, CNN cited U.S. officials promising additional charges against Assange. 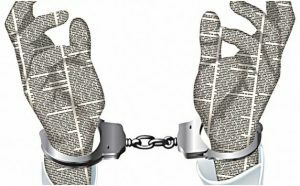 The press freedom implications of any future charges could be significant–especially if they involve the Espionage Act. “It may be part of a larger case,” Ben Wizner the director of the American Civil Liberties Union, told CPJ. The current indictment already cites the Espionage Act and describes the cracking of a password as part of a conspiracy to violate it. The DOJ’s legal strategy could be to pile on more charges after Assange is extradited. The extradition treaty between the U.S. and the U.K. says an individual can only be charged for the “offense for which extradition was granted” or similar offenses, but it also stipulates how governments can waive this rule. The indictment goes on to characterize a number of journalistic practices as part of a criminal conspiracy, including use of a secure message service, use of a cloud-based drop box, and efforts to cover Manning’s tracks. In all of the concern over the Espionage Act, journalists may not have sufficiently raised alarm over the law under which the U.S. charged Assange: the Computer Fraud and Abuse Act (CFAA). “Thinking we should breathe a sigh of relief because it was the CFAA instead of the Espionage act is premature.” Cohn, of Electronic Frontier Foundation, told CPJ. “For almost every reporter working with a source, the source is providing information in digital form. Anyone who is working with a source who obtained that info in a way that they weren’t supposed to has a CFAA risk,” Cohn said. (5) Ecuador’s withdrawal of asylum raises questions. In a video statement accompanying the tweet, he cited Assange’s repeated “intervening in the internal affairs of other states” via WikiLeaks publications. Ecuador had previously restricted Assange’s access to the internet based on allegations that he was interfering in U.S. elections and in the referendum for Catalan independence from Spain. While Assange’s unusual presence in a diplomatic mission created tensions–both inside the embassy and in Ecuador’s broader international relations–withdrawing asylum is an extreme measure, and one that could have troubling implications if it was done in response to publishing. *Alexandra Ellerbeck, CPJ’s North America program coordinator, previously worked at Freedom House and was a Fulbright teaching fellow at the State University of Pará in Brazil. She has lived in Chile, Bolivia, and Brazil. *Asher-Schapiro is CPJ’s research associate for North America. He is a former staffer at VICE News, International Business Times, and Tribune Media, and an independent investigative reporter who has published in outlets including The Atlantic, The Intercept, and The New York Times.